1. Remove these items: вЂў Center vent for w i t h navigation system (see page 20-178) вЂў Audio unit for without navigation system (see page 23-115) 2. Remove the hazard warning switch (A). NOTE: Make sure the correct test lead (+ or вЂ”) is placed on the terminal. 4. 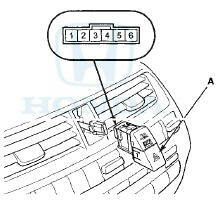 If the continuity is not as specified, replace the hazard warning switch.